The Force Quest begins in The Flash #58, written by Joshua Williamson, with pencils by Rafael Sandoval, inks by Jordi Tarragona, and colors by Tomeu Morey--but it’s not off to a quick start. Previously, Barry Allen discovered that, in addition to the Speed Force, there were also three other Forces (Strength, Sage, and Still). He soon after suffered several personal setbacks, and decided to set out on a quest to better understand all of the Forces with the help of his girlfriend Iris. Now, Iris has lured him to Badhnisia, outside of his comfort zone, to track down possible incidents of the other Forces being used. Unfortunately, that leads them right smack into a heist by a couple of superpowered treasure hunters who don’t take kindly to Flash’s interference. As stated above, this story gets off to a slow start, and that’s disappointing, considering how much Williamson has been building to this arc. He has slowly torn the Flash down, having Barry make poor decisions, lose the support of his closest allies, and then become second fastest man alive after losing a race to his former sidekick. All of these events have lead to Flash going into a personal tailspin, only to be saved by Iris and her urging him to leave Central City to rediscover himself and the Speed Force. One might expect this arc to really take off with a bang after all of that, but Williamson has opted to ease the audience into this story instead. Flash, in search of answers to the Forces, stumbles into a couple of villains that feel like they walked right out of a 90’s DC comic, only to leave them behind abruptly to get to the only interesting part of the story on the final page. 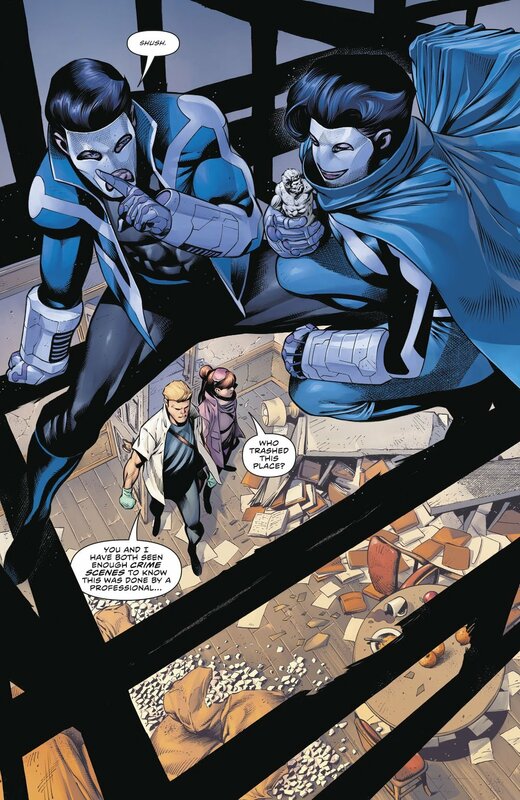 The villains introduced here, collectively called Gemini, don’t seem like major threats outside of a few moments of surprising Flash, and their motives of stealing objects that may or may not have something to do with the new Forces don’t do much to help them. Readers have seen two arcs in a row now of people using, or being used by, the new Forces, so it’s time to give them a little more. Gemini was a missed chance to do that. Instead, readers were treated to a watered-down version of the Strength and Sage Force arcs crammed into one issue, and then given a cliffhanger scene that will make everyone wish the whole issue had revolved around that instead. The art this issue was, thankfully, very strong. Sandoval’s pencils are a great match for this book, even if his Flash is a little beefier than he should be. His style feels a little like Howard Porter with a touch of Mike Wieringo, while still having a flair of its own. Tarragona and Morey also take the art to new levels on the inks and colors. The Flash is constantly on the move this issue, so they get a chance to really show off what they’re capable of thanks to the electricity and light being thrown in every direction on 90% of the pages. In the end, if you’re just picking up this book for the first time with this issue...apologies are in order. It’s normally a much better read. Stick around to see what happens with that cliffhanger, because it’s pretty much guaranteed to be uphill from here on out. And, if you’re a longtime reader of Williamson’s Flash, you know he has been building to something big with Barry for a while now, so it will definitely be worth waiting to see that plan unfold.